For those who recall the Tazoberry line of drinks, Starbucks introduced the “Tazo Citrus” new on April 24, 2002, shortly after the success of their first drink, Tazoberry. This week I broke my piggy bank and reached out for a “venti” (that means extra large) nonfat, nondairy, noncoffee Tazo Citrus drink, new from Starbucks. Here’s the blueprint: a 20-ounce icy blend of tangerine and orange juices, with a hint of lime and Tazo green tea. Total calories: 250. Fat grams: 0. Dietary fiber: 0 grams. Manufacturer’s suggested retail price: We’re talking about a Slurpee that’ll run you $3.85. Welcome to Starbucks; who’s next, please? For something that’s non-this and non-that, the Tazo Citrus carries a pretty hefty price tag. The green tea isn’t the only thing that’s steeped. Naturally, Starbucks’ icy drink commands top dollar because it’s made with real fruit juice and expensive imported tea leaves from the Tazo Tea Co., which happens to be Starbucks’ private label. It’s an inside deal. Tazo green tea boasts special “calming and rejuvenating” properties. Hey, one or the other. Stop tugging me in different directions. Here’s something new for the Drive-Thru Gourmet – a product that actually is good for you. 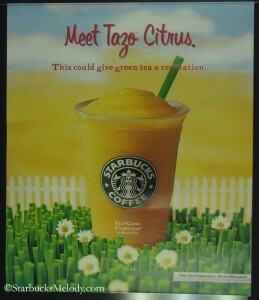 Each Tazo Citrus provides 50 percent of the recommended daily requirement for Vitamin C.
Today, customers at Starbucks Coffee Company (Nasdaq:SBUX) will use signature green straws to sip two new blended beverages to help squelch the summer heat. The first of these beverages, Mocha Coconut Frappuccino(R), is an indulgent treat of rich chocolate and real toasted coconut blended with coffee, milk and ice, then topped with whipped cream, chocolate drizzle and more toasted coconut. The second beverage, Tazo(R) Citrus, is an icy blend of tangerine and orange juices, accented with a hint of lime and Tazo green tea. Both of these tasty treats are now available at Starbucks retails stores across North America. Mocha Coconut Frappuccino rewards customers with the irresistible combination of chocolate and toasted coconut, perfect for a day or evening treat. A cool blend of Starbucks coffee, milk and ice, Frappuccino(R) Blended Beverage is a handcrafted beverage introduced in 1995. The original Frappuccino flavors — coffee and mocha — have been joined over the years by Espresso Frappuccino(R), Caramel Frappuccino(R), Chocolate Brownie Frappuccino(R) and now for a limited time, Mocha Coconut Frappuccino. 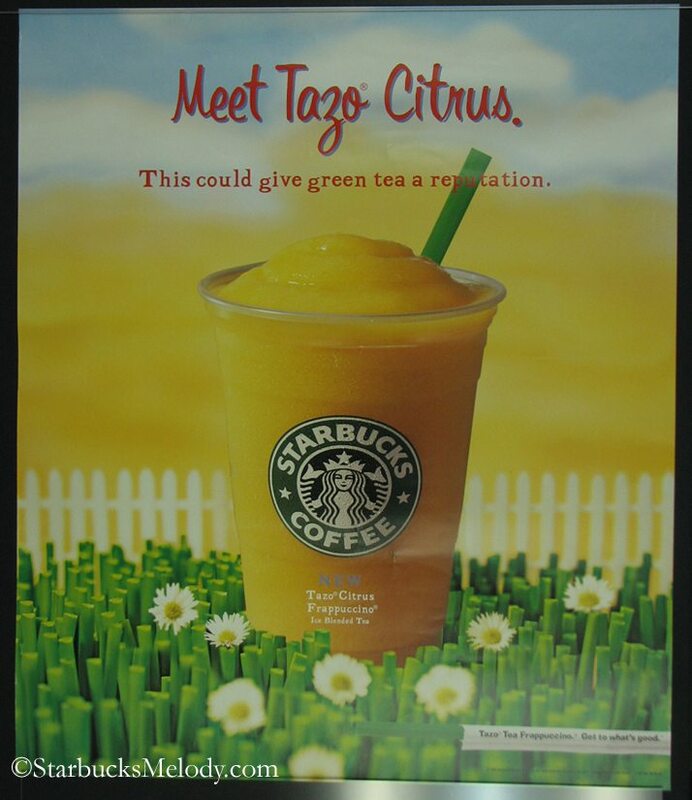 In April 2001, Starbucks introduced Tazo(R) Ice Blended Tea as a non-coffee, non-fat and non-dairy alternative to accompany its Frappuccino Blended Beverage. Tazo Citrus joins Tazoberry(R) in the category this summer, providing customers with their choice of two cool and healthy coffee alternatives for the summer months. For those looking for a little more indulgence, try a Tazo(R) Citrus and Cream or Tazoberry(R) and Cream, combining Starbucks exclusive Tazo Ice Blended Tea with cream and topped with whipped cream. Starbucks Coffee Company is the leading retailer, roaster and brand of specialty coffee in the world. In addition to its retail locations in North America, Europe, the Middle East and the Pacific Rim, Starbucks sells coffee and tea products through its specialty operations, including its online store at Starbucks.com. Additionally, Starbucks produces and sells bottled Frappuccino(R) coffee drink and a line of superpremium ice creams through its joint venture partnerships. The Company’s other brands enhance the Starbucks Experience through best-of-class products: Tazo Tea Company offers a line of innovative premium teas, and Hear Music produces and distributes a line of exceptional compact discs. I think that Starbucks is still trying to innovate around the category of non-dairy blended beverages. Recently, Starbucks did massive testing of both the Pink Lime Frozt and the Coconut Lime Frozt, and from what I know, the response was very positive. I think it will be interesting to see if Starbucks will again try to introduce another non-dairy blended drink into the lineup. Hope you enjoyed the Tazo Citrus poster and Starbucks history lesson. You can browse the whole Tazo Tea category by clicking here. I remember when this launched in Australia, we had Mango Citrus and Raspberry Tea Frappuccinos. For a limited time, we also had Tangerine Lime (which tasted very similar to Mango Citrus, but a lot less sweet). And the bottles the juice stuff came in were massive!! Almost 2 litre heavy things! All kidding aside, thanks for the walk down memory lane. It’s nice to see Starbucks continue to try new things in an attempt to find the right mix. The point made in the article about an expensive Slurpee is probably pretty significant. Nice to see Starbucks keep trying, but I imagine it’s been very tough to come up with something like this that would stick. I loved (LOVED) the tazoberry ‘n cream……. had it every late afternoon for a time. I could never understand why they dropped that one….I know it sold well here…. I loved the poster. Too bad the signs these days seem so ordinary compared to years ago. I am not so sure this drink would be as popular as it was when it first came out, but it would be interesting to test it again. I love this drink, since I am both a green tea drinker and a lover of oranges and its cousins. Too bad that they decided to drop this drink from the menu. Why don’t we have Starbucks in Nigeria? I went to your website because in hopes of finding your Tazo Citrus drink. I was reading that Robin Roberts from Good Morning American was having trouble with her stomach due to her chemotheraphy. I wanted to suggest to her the Tazo Citrus drink but you don’t carry it anymore. Let me tell you that I went through chemo Dec 2002 – Jan 2003 and I couldn’t have survived without the Tazo Citrus drink. I was very sick at work and one of my coworkers called friends and they recommended the Tazo drink. My coworker bought me the Taxo Citrus drink and I sipped on it throughout the morning and it settled my stomach. Everytime I went through chemo my coworker would get me the drink and sure enough it settled my stomach. I wish you still had that drink because I have known several people who have gone through chemo and could have used this drink. I even recommend it to someone who was nausea after surgery and they agreed that it helped them. I think this tea could help Robin Roberts and other people like her. I would purchase it if you brought it back and would make sure people knew about this drink. Anyone have a recipe for making the tazo citrus? That was my favorite drink and I’d love to have another one.